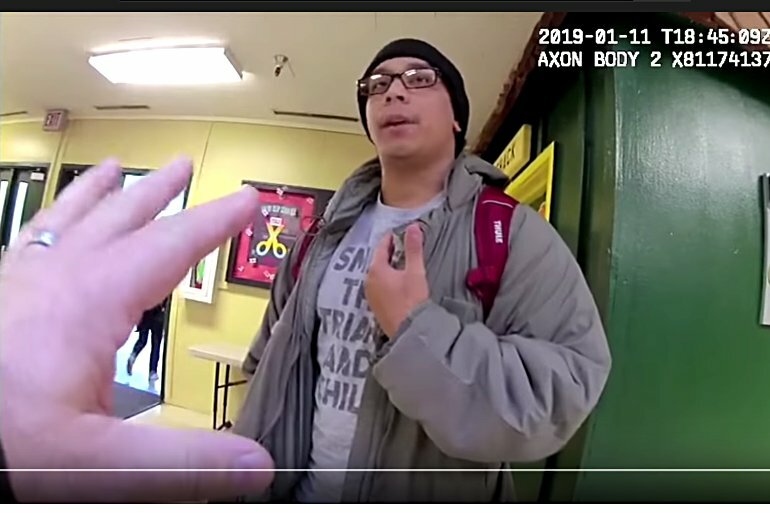 VIDEO – ANTIFA member shot dead after drawing down Eugene, OR cops… in a school! Charlie Landeros, aged old enough to know better, loved his far-left activism. He belonged to an armed Antifa group we've covered, training "oppressed peoples" in armed self-defense. And now he's no longer with us after drawing down on two Eugene, Oregon police officers who attempted to arrest him at a Eugene middle school there. Police believe the radical Antifa activist showed up at his daughter's school on January 11 intending to pick her up. Cascade Middle School administrators, however, knew that he had recently lost custody of his child and called police to remove him from school property. What they didn't know was Charlie had a gun on his hip along with a backpack full of loaded magazines and more 9mm ammunition. …supports movements that seek to dismantle the political and economic structures at the root of social inequality and environmental destruction. We provide litigation, education, legal and strategic resources to strengthen and embolden their success." Apparently their training in armed self-defense fell way short. After all, when Landeros accepted the room temperature challenge and drew down on the police, they dealt with his threat exactly as you'd expect. They shot him as part of taking him down. And when Landeros continued trying to mortally wound the officers, they shot him some more while he was on the ground. They shot him decisively enough that they didn't need to transport him to the hospital. Boom, headshots! Instead, they put a yellow sheet over his dead body. No one knows why, in addition to the gun on his hip, that Landeros brought a backpack full of ammunition and loaded magazines to the school that day. Best guess may be that Eugene police stopped a school massacre by an unhinged loser. Either way, we have no doubt that Bloomberg's Everytown for Gun Control and Gabby Giffords' eponymous group will, of course, count Landeros' death as another "school shooting" and yet another reason we should surrender our right to keep and bear arms. They'll have to forgive us if we draw a different lesson from the incident and the inherent danger of "gun-free" zones. This entry was posted on February 2, 2019 at 1:40 pm and is filed under Blog. You can follow any responses to this entry through the RSS 2.0 feed. 9 Responses to VIDEO – ANTIFA member shot dead after drawing down Eugene, OR cops… in a school! Well, he did manage to chill, but apparently failed in smashing the "patriarchy". Oh, and look, there was an attempted retaliation, apparently. I'm weeping as I write this….. I'm not surprised. Communists are horrible, arrogant people (just like today's DNC) who think they have the right to everything and anything. Including murder. I know. They murdered four of my family members. That ANTIFA jerk would have murdered both LEO's easily if he could have and justified it in the name of the "cause". To them the ends always justify the means. And the media says NOTHING about this incident…but if he had been a Trump supporter CNN, etc and the newspapers would have been on it for a week. Exactly. The only communist I trust is one where my Winchester barrel is in their mouth, their head is ducktaped to the barrel, chamber loaded, hammer back and my finger on the trigger. OK, so I'm just speculating about this, but something seems wrong with the whole picture. Could this guy be dumb as a box of rocks or is there another motive at work here. He had to know of his loss of the custody of his child. On the other hand did he martyr himself as a way for them to start operations against L.E.. On the other hand he could this have been setup by someone else in the group to set him to be sacrificed as a martyr for this same purpose. I am very grateful that none of the police officers were harmed in this instance. These individuals and this group of Anti-fa are America's version of the Brown Shirts and the Red Guard. It is disturbing to note that Portland is their home base and now it appears that Eugene is their number one satelite. 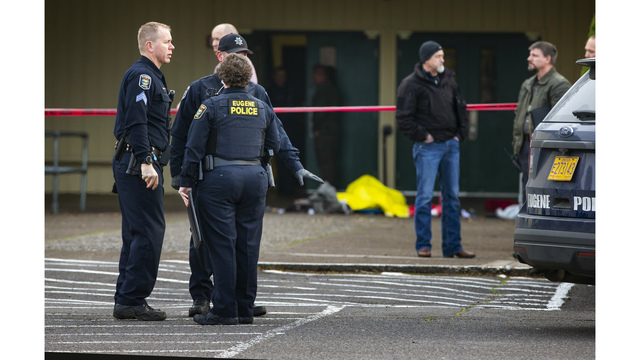 More disturbing is the recent bombing attempt on the Eugene Police Department. Enemy lines are being drawn.